Master photographer Kevin Richardson, founder of Dance as Art - The New York Photography Project, along with both accomplished dancers and young aspiring ballerinas will come to the Astolat Dollhouse Castle in Manhattan's Time Warner Center on Thurs., Dec. 3, followed by a public family photo-op day with a real-live prince and princess on Sat., Dec. 5 to benefit Orphans International Worldwide (invite). Both are open to the public. as a public celebration of New York's talented dancers. Photo: Dance as Art. 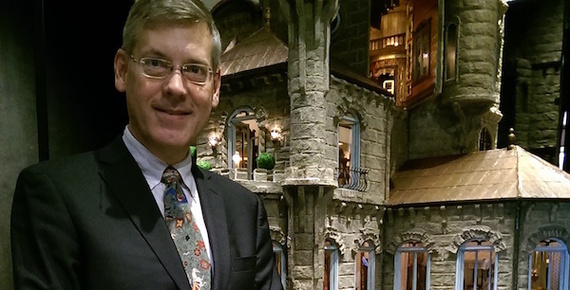 On Thurs., Dec. 3, from 7-9 p.m., this $8.5 million dollhouse on the second floor of the Shops at Columbus Circle will host a special evening featuring an exhibition of Kevin's breathtaking photographs taken at iconic locations around New York City. He will also unveil several shots in front of the Astolat Castle taken in the last week. On Sat., Dec. 5, from 12-4 p.m., a real live prince and princess will pose with your family wearing crowns for your holiday photo to benefit orphans in Indonesia. Entrance is $10 per person or $20 per family. The photograph package is $35 to benefit children. The Saturday event is sponsored by the newly formed New York Global Leaders Club with support of the J. Luce Foundation to benefit Orphans International Worldwide (OIWW). 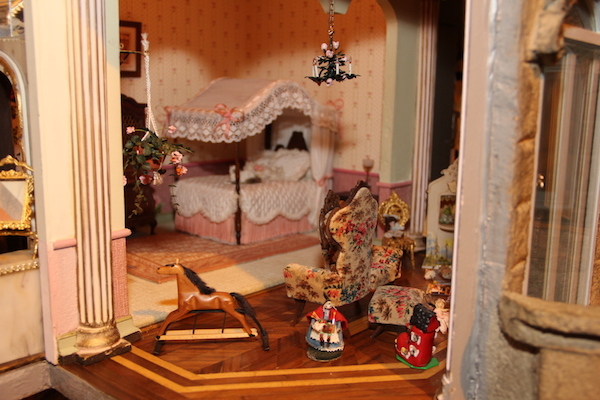 The world-famous Astolat Dollhouse Castle, on tour to benefit children's charities, was built and furnished by master artisans. It features 29 rooms filled with 10,000 miniature pieces, including elaborate furniture, oil paintings, mirrors, fireplaces, gold miniature jewelry, rare-mini books more than 100 years old, fine rugs, fabrics, and pieces made of and silver and gold. This dream for children and adults alike has seven levels, stairways, hallways, a basement, a wine cellar, a kitchen, an armory, a library, a music room, a grand ballroom and a Wizard's tower on the top level. It was recently valued at $8.5 million dollars thanks to the nearly 30,000 pieces that make up the collection. The castle is a perfect background for master photographer Kevin Richardson who has photographed in public spaces including Grand Central Station and subway cars. When he heard about the Astolat Dollhouse Castle he felt it would be the perfect backdrop for his photography and young ballerinas. Manhattan. Photo: Astolat Dollhouse Castle Children's Charities Fund. Part street show, part fine art, Kevin created Dance as Art - The New York Photography Project as a public celebration of New York's talented dancers as well as a call to remember and support the arts and artists. 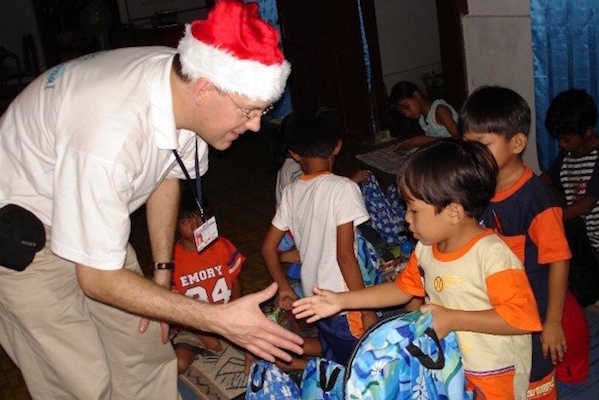 I founded Orphans International Worldwide in 1999 with an emphasis on Raising Global Leaders. Our first home opened in Sulawesi, Indonesia in 2001, funded by my mother's estate. Today our graduates are in university there where we continue to support them. The Astolat Dollhouse Castle Children's Charities Fund has graciously given us this pre-Christmas spot to benefit our kids. supported in the local university. Photo: Orphans International Worldwide. Kevin Richardson, a globally recognized fitness trainer by day and a dance photographer by night, also strives to help young people. His unique style of photographs have become wildly popular on Instagram and Facebook, with over 45,000 followers and likes, and highlight dancers throughout the Northeast. Kevin stages the awe-inspiring photographs and then provides them pro bono to the dancers for use in their portfolios. My mission is to bring dance to the streets where kids who might not ordinarily have a chance to see accomplished dancers can be inspired and have exposure to the art of dance. Part street show, part fine art, Dance as Art - The New York Photography Project, is a public celebration of the talented dancers of New York. and a call to remember and support the arts and the City's artists. Hailing from the islands of Trinidad and Tobago, Kevin is a globally published photographer who refers to himself as an 'accidental photographer.' What started as an avocation to his full time job as one of New York's most sought after personal trainers, has taken him around the world. His landscape and signature outdoor photography here have been published internationally and he has done portrait and event photography for celebrities here as well as corporations in Asia. To date, Kevin's dance photographs -- known for their dramatic lighting as well as their unusual backgrounds -- have only been available on-line. For the first time, the photographer will print a collection of his photographs and the limited signed and numbered collection will be on display on Dec. 3 for purchase with net proceeds from the sale donated to the Astolat Dollhouse Castle Children's Charities Fund. Admission to the special event where guests can meet Kevin and several of the dancers he has photographed, is free and open to all, however a suggested donation of $25 will be accepted for donation to children's charities through the Astolat Dollhouse Castle fund. Photo: Astolat Dollhouse Castle Children's Charities Fund. The Astolat Dollhouse Castle will be on display daily on the second floor Mezzanine of the Shops at Columbus Circle through December 8 during retail store hours. Voluntary donations to benefit children's charities are greatly appreciated and can be made online at www.dollhousecastle.com. "Family Photo-Op day with Prince & Princess"